This is a book about two men making the most important decisions in the world. One is Barack Obama. The other is Ben Rhodes. Rhodes puts us in the room at the most tense and poignant moments in recent history. 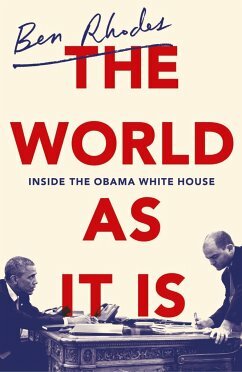 A revelatory, behind-the-scenes account of the Obama presidency from perhaps his closest collaborator, and a political memoir about the power of words to change our world. From 2009 to 2017, Ben Rhodes served as Deputy National Security Advisor to President Obama overseeing the Administration's national security communications, speechwriting, public diplomacy and global engagement programming. Prior to joining the Obama Administration, from 2007-2008 Rhodes was a senior speech-writer and foreign policy advisor to the Obama campaign. Before joining then Senator Obama's campaign, he worked for former Congressman Lee Hamilton from 2002-2007. He was the co-author, with Tom Keen and Lee Hamilton, of Without Precedent: The Inside Story of the 9/11 Commission. A native New Yorker, Rhodes has a B.A. from Rice University and an M.F.A. from New York University. "A page-turning, unfiltered, altogether human look at Barack Obama’s presidency. Ben Rhodes — one of Obama’s closest and most important advisers — opens up the defining issues of the presidency: from the role of race and the rise of conspiracy theories to the hunt for bin Laden, the Syria “red line” debate, and the secret negotiations Ben himself led to normalize ties with Cuba. Insightful, funny, and moving, this is a beautifully observed, essential record of what it was like to be there."